This article first appeared in The Edge Malaysia Weekly, on December 3, 2018 - December 09, 2018. RECENT news reports have hinted at a possible recovery in crude palm oil prices, which have been falling for months. But plantation stocks may not be out of the woods yet. Already, most planters have seen their margins decimated this year even as CPO prices slid to a nine-year low of RM1,716.00 per metric ton (MT) on Nov 21, according to Malaysian Palm Oil Board (MPOB) spot price data. The multi-year low was a far cry from the monthly average spot price recorded in November last year of RM2,689.00 per MT, based on MPOB data. Not surprisingly, most plantation stocks have tumbled. This, in turn, presents a buying opportunity but the timing of entry is critical. A survey of 41 counters classified as plantation stocks on Bursa Malaysia indicates that 88% (36 stocks) had lost value year to date. Up to Nov 29, the 36 counters had shed between 0.77% and a massive 59.2%, according to Bloomberg data. In terms of price-earnings ratio (PER) — which measures a company’s market price relative to its earnings — the valuation range has widened from as low as 8.46 times to as high as 153.7 times. Ivy Ng, regional head of agribusiness research at CIMB Investment Bank, tells The Edge that she expects financial results in the quarter ending Dec 31 to be generally “weaker” quarter on quarter and for CPO prices to remain sluggish. When that turning point for CPO prices may come remains unclear. As at Nov 28, the MPOB spot price for CPO was RM1,732.50, marking a 29.8% reduction since the year began. 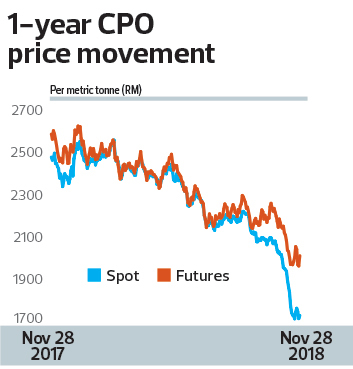 Meantime, CPO futures fell to a three-year low of RM1,966 per MT on Nov 27, over a fifth lower than early in the year, based on data tracked by Bloomberg. The downward trend prompted the government to slash its CPO export tax rate from 4.5% in August to 0% in September. The rate has been maintained up to now. In Indonesia, local authorities last week announced a reduction in the export levy for both CPO and processed palm products to US$0 per MT when CPO prices fall below US$500 (about RM2,089.12) per tonne with incremental increases as CPO prices rise. “The latest policy will take effect as soon as the (Indonesian) finance ministry issues the regulation (said to be on Dec 2). Pending details, we are generally positive on this change as it may help to reduce Malaysia’s high stockpile,” says Maybank Research in a Nov 27 note. Another potential demand catalyst is near. Beginning Dec 1, Malaysia will raise the minimum bio-content of biodiesel from 7% to 10% (B10) to help boost consumption of palm oil locally. This follows Indonesia’s B20 implementation in September. In a radio interview, Primary Industries Minister Teresa Kok said the increase is expected to double domestic usage of palm oil. But the jury is still out on whether the measures will suffice to boost demand and by extension CPO prices, which have been mired this year in a cocktail of output and stockpile glut, sluggish demand, trade war woes and environmental anti-CPO activism. In a nutshell, rising production has outpaced demand. From 1.54 million tonnes as at January 2017, stockpiles in Malaysia had steadily climbed to 2.72 million tonnes as at October this year. By year-end, that figure may hit 3.5 million tonnes while Indonesian stockpiles may rise to five million tonnes, Mistry reportedly said. Meantime, demand from major markets has been sluggish. For example, India — the world’s top palm oil importer — has slowed down purchases amid a weak rupee and higher import duties. These factors, combined with uncertainties over the US-China trade war and a high-profile protest by activist group Greenpeace in November against palm oil, have culminated in the current weak CPO price environment, said Sime Darby Plantation Bhd chief Tan Sri Mohd Bakke Salleh two weeks ago. That said, Mohd Bakke expressed optimism that CPO price “has bottomed out” and feels it should pick up to between RM2,200 and RM2,400 per MT in the first quarter of 2019. Naturally, any CPO price recovery will be good news for both plantation stock prices and earnings. However, the subsequent share price rebound in general could also mean that long-term investors may miss the boat on potential value buys that have emerged following the CPO price tumble. A fund manager who declined to be identified says a key signal to watch before moving in on potentially undervalued planters is any clue that demand is rising. However, the fund manager opines that CPO prices and plantation stocks may not have truly bottomed out in general, not “until the trade war is over”. In the meantime, the current weak CPO price environment offers a good gauge of the planters’ resilience and the efficiency of their operations. For Ng of CIMB Investment Bank, separating the good from the mediocre comes down to the fundamentals of “management (track record), liquidity, age profile (of palm oil trees), earnings prospects and valuations”.